Briare is south of Paris on the right bank of the Loire River, on the western edge of Burgundy. It's 150 kilometers south of Paris and 70 kilometers east of Orléans, in the Loiret département, The Canal Latéral à la Loire crosses the river at Briare on a spectacular canal bridge or aqueduct, and connects to the Canal de Briare, which leads north to the Seine and on to the North Sea and Atlantic Ocean. We will stay here for a day before starting our one-week trip south to Decize on the Canal Latéral à la Loire on a rented canal boat. The region of Burgundy, or Bourgogne in French, is very recognizable among English speakers thanks to its wine. Burgundy is a former administrative region, now part of the Bourgogne-Franche-Comté region and including four départements including Nièvre. 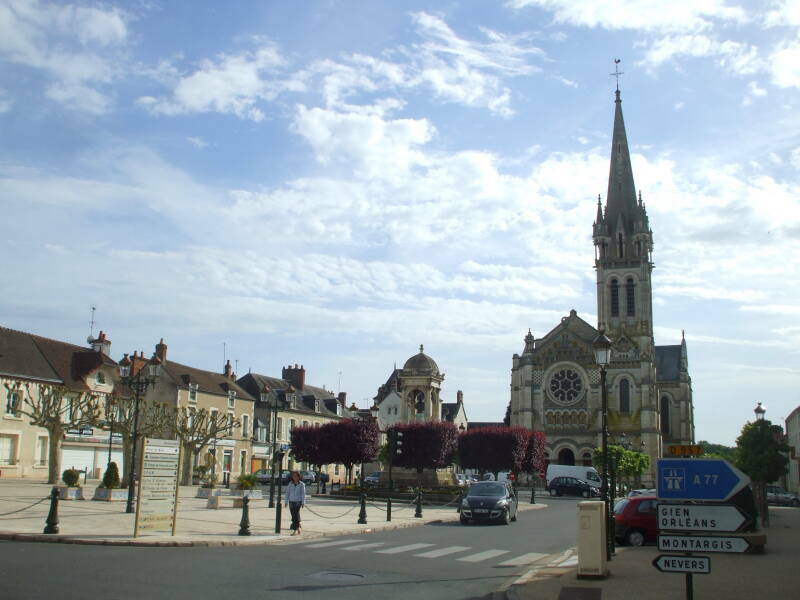 Our trip will also take us sound along the western edge of Burgundy, through the eastern parts of the Loiret and Cher départements of the Centre-Val de Loire region. The SNCF railway station is on the north edge of town. There are inter-city trains from Paris Gare de Bercy to Briare, they take about 90 minutes. 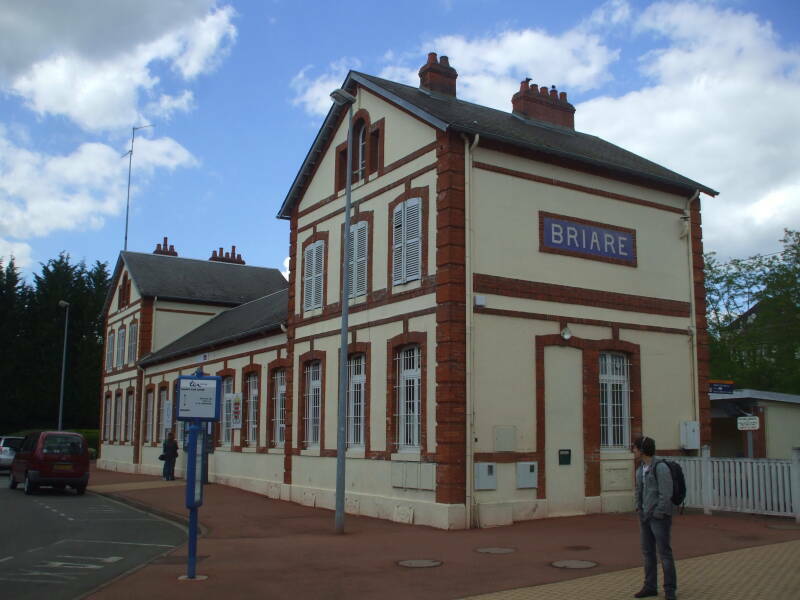 Many of the trains running on the Paris-Nevers line do not stop at Briare. On a typical day there might be two trains in the morning leaving Paris and stopping in Briare, and another in early afternoon. Then, at the end of a weekday, there might be trains leaving Paris around 1700, 1800, and 1900 for commuters, but then that one at 1900 might be the last train stopping at Briare until the next morning. The A77 motorway, the Autoroute de l'Arbre, runs past Briare a kilometer to its east. The N7 highway goes around the east edge of Briare. The D957 road runs through the center of town as seen above, between the Loire on the west and the A77 motorway on the east. 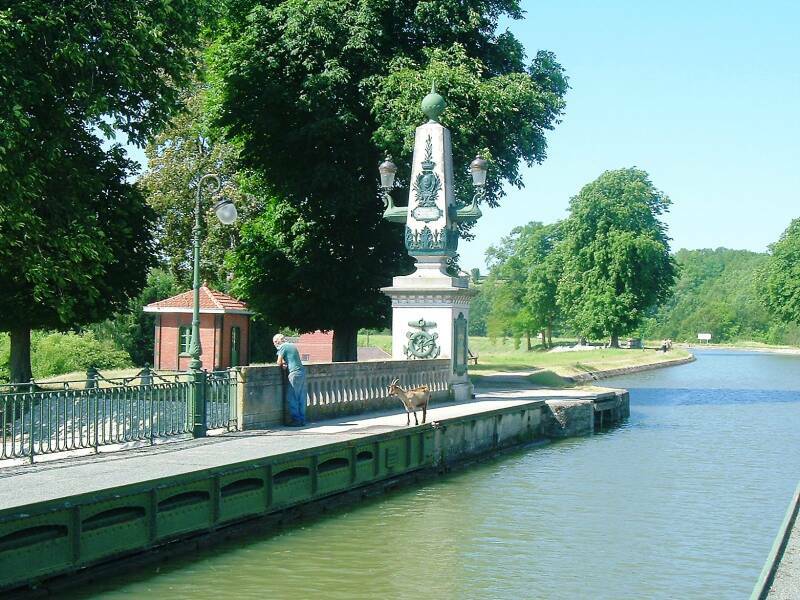 Briare has been settled since before the Romans came into the area. The Romans called the settlement Brivodurum, based on the original Celtic name Brivo for "bridge" plus the Latin durum for "fortification." 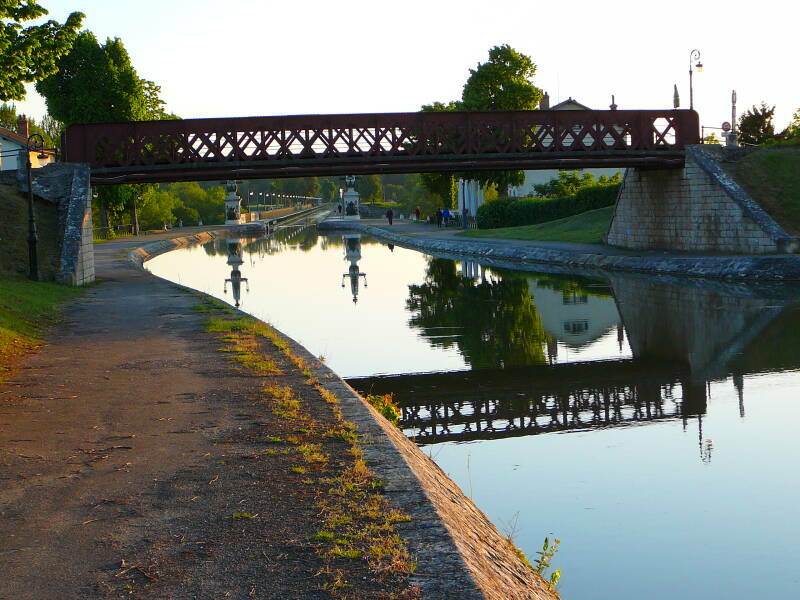 The canal de Loyre en Seyne was the original canal project started in 1604 under Henry IV, and was completed and named the Canal de Briare in 1642. 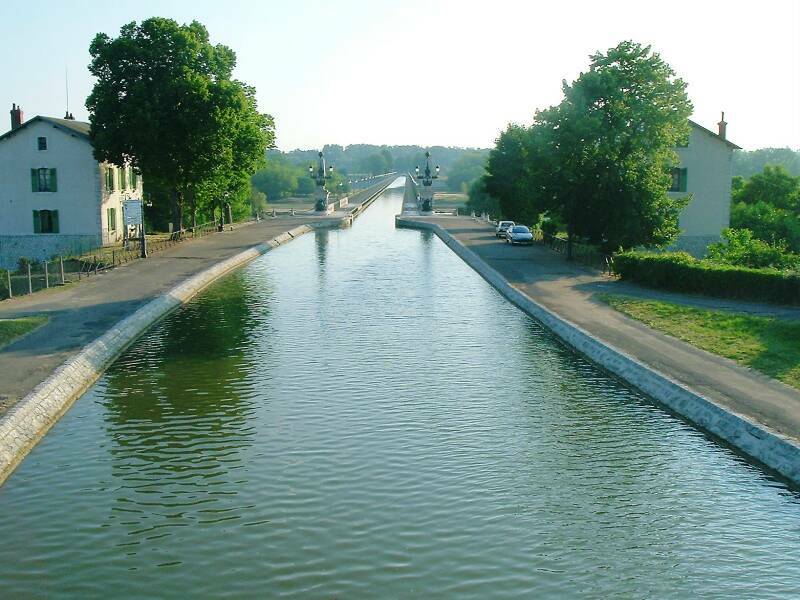 The Canal Latéral à la Loire was then built between 1827 and 1838. It ended a few kilometers upstream and across from Briare. The boats had to cross the Loire. 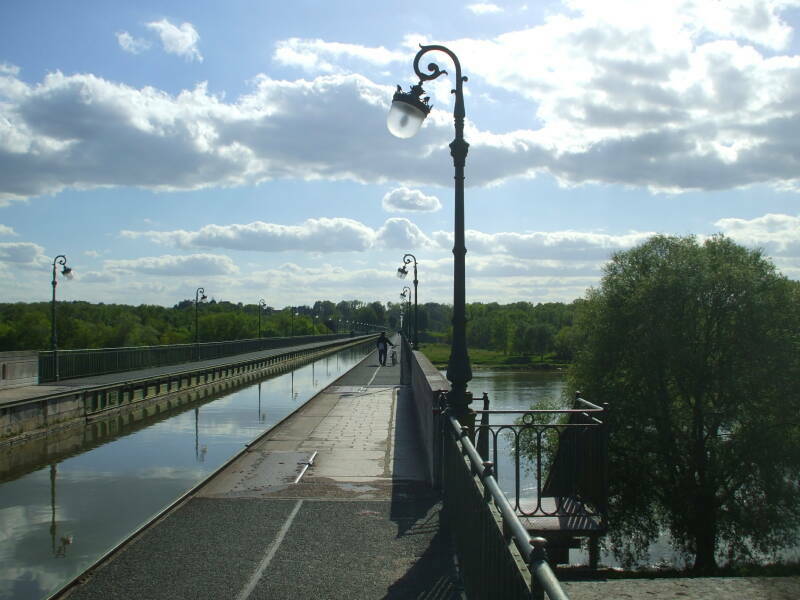 The canal was extended and the large Pont Canal or Canal Bridge was built across the Loire in 1896. 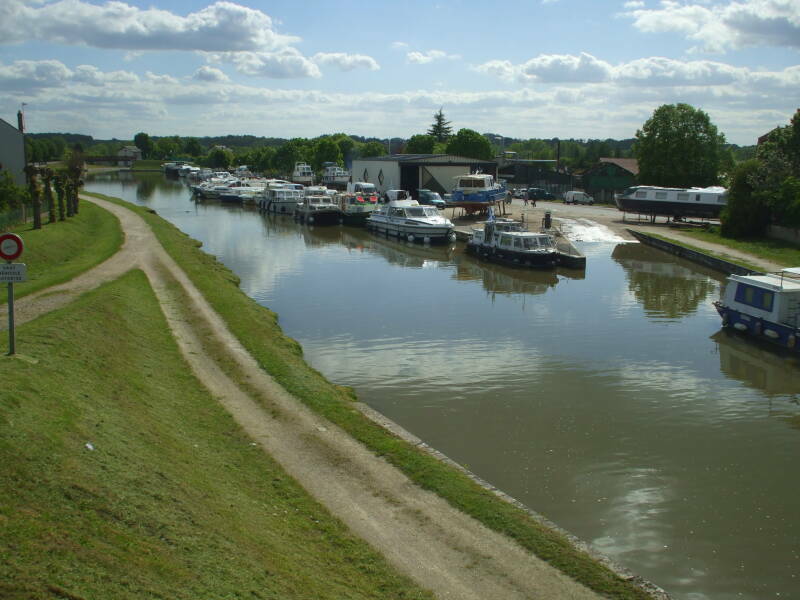 The Canal Latéral à la Loire was a nice shipping channel running north along the Loire for 196 kilometers from Digoin past Decize (where our boat trip was headed) and Nevers to Châtillon-sur-Loire, just across the Loire from Briare. At its south end it connected via a canal to a navigable river leading to the Mediterranean. 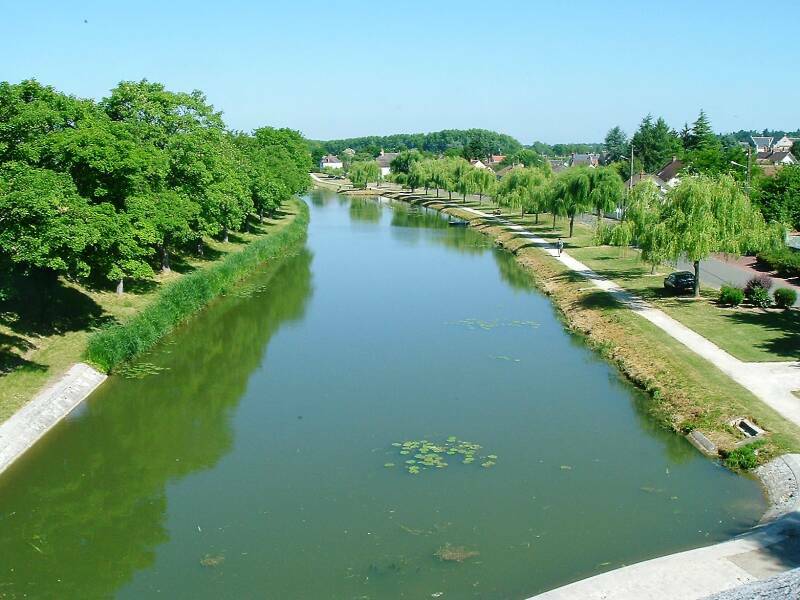 The Canal de Briare led north to the Canal du Loing and on to the Seine, which was navigable out to the Atlantic Ocean and North Sea. The problem was the break in this central link. 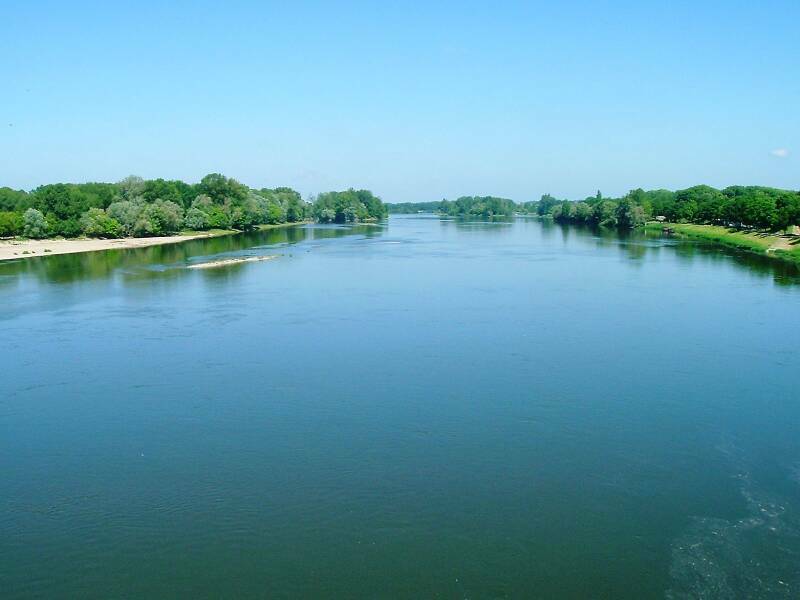 A boat had to lock down to the broad, shallow, and often flooding Loire in order to get from from Châtillon-sur-Loire to Briare. 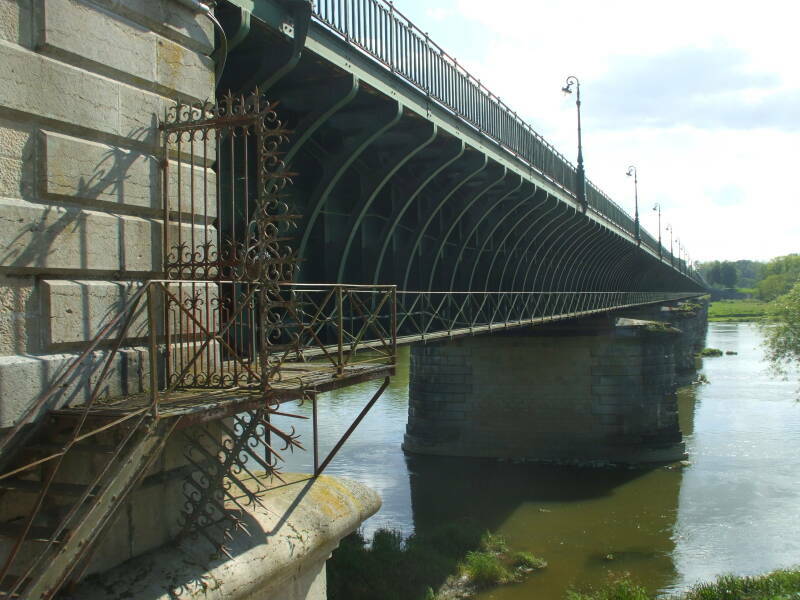 There was a pair of dikes across the Loire, but it was still a hazardous crossing. 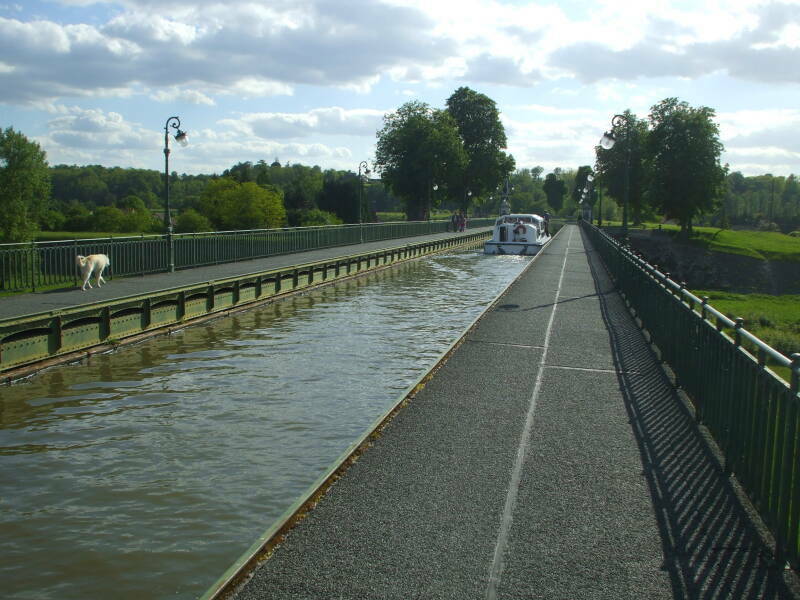 Then it was into the old canal, and up through a series of locks to the Canal de Briare. 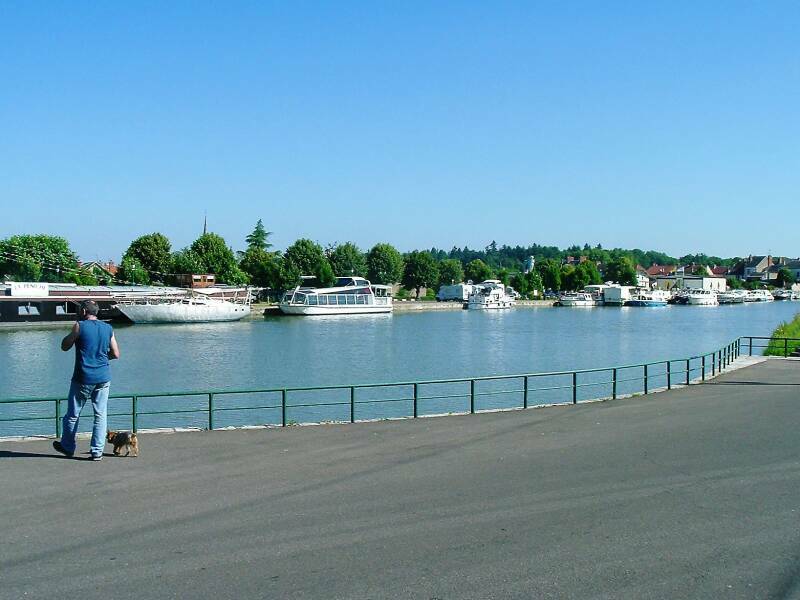 The broad and shallow Loire River at Briare. 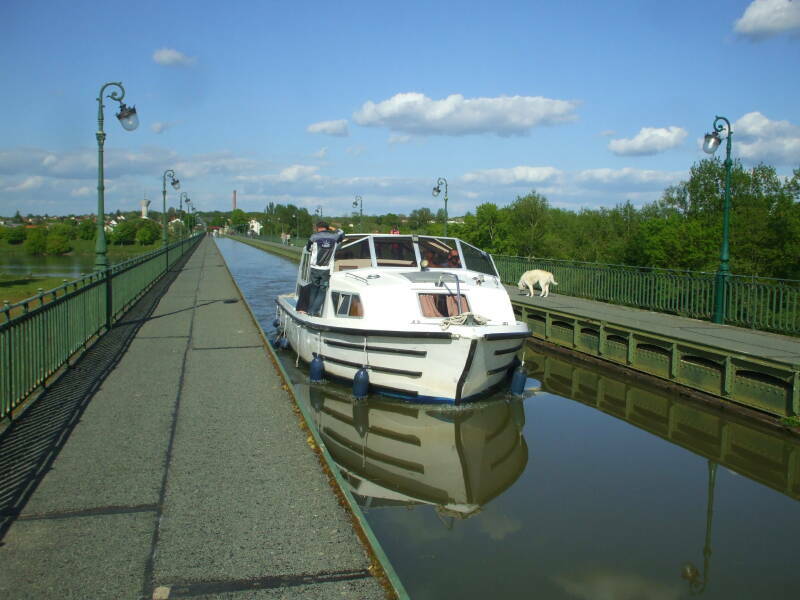 The narrow old canal between the Loire and Briare. 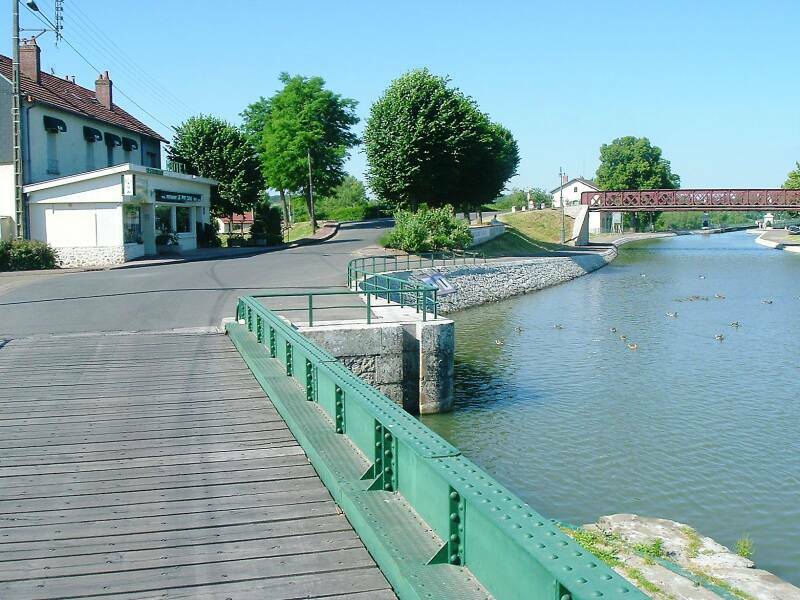 In 1896 the Pont-Canal Briare or the Briare Canal Bridge was opened. 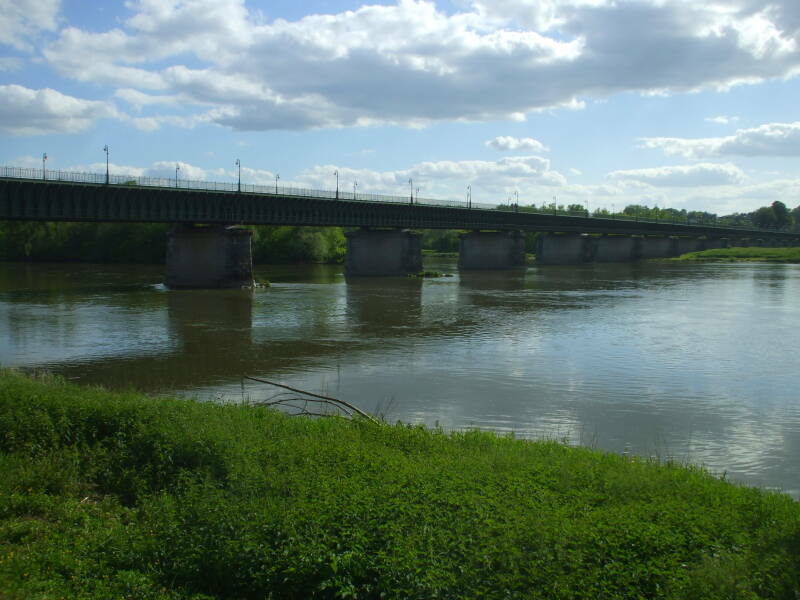 That provided a level and lock-free passage from Châtillon-sur-Loire to Briare, passing above the Loire in an aqueduct. At 662 meters, it was the longest navigable aqueduct in the world from when it opened in 1896 until 2003, when the 918-meter Magdeburg canal bridge across the Elbe was opened. 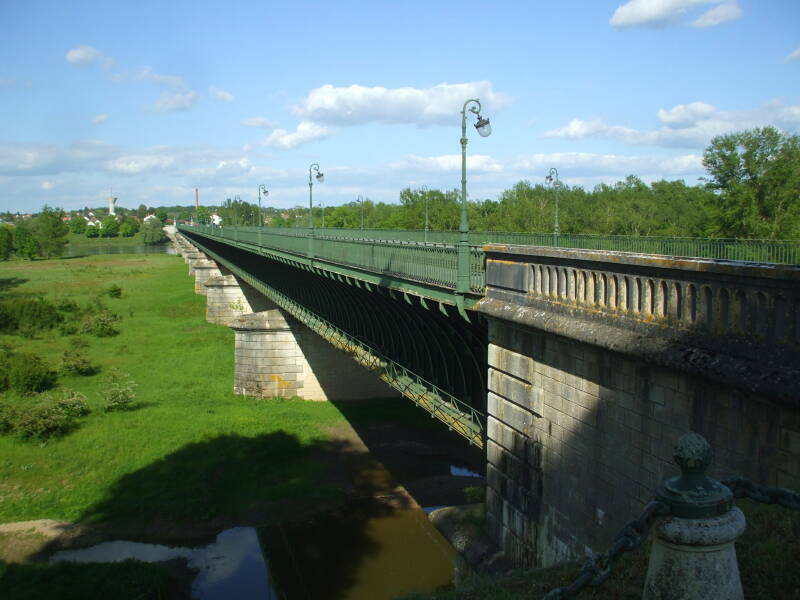 The engineers Leonce-Abel Mazoyer and Charles Sigault designed the Briare canal bridge. 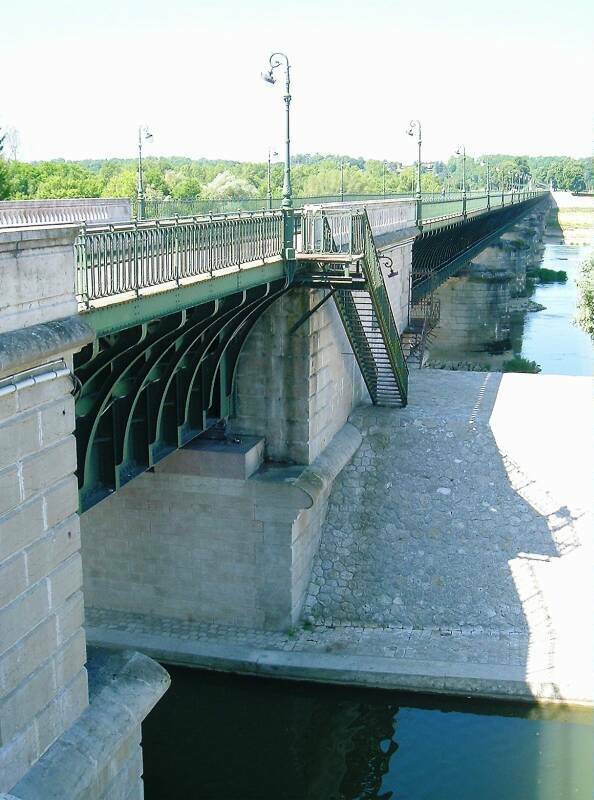 It could not be an all-masonry structure like the large canal bridge at Guétin or other similar but smaller examples. Close-spaced stone arches would be a barrier to major floods, backing up water above it to increase flooding, destroy the bridge, or both. Their design used 14 widely spaced stone piers supporting an enormous steel I-shaped beam which in turn holds a steel channel carrying the canal. Gustave Eiffel was responsible for part of this project. As he is best known today for his 324-meter-tall wrought iron tower in Paris, you might assume he was involved in the metal structure. But no. To my surprise, Gustave Eiffel was responsible for the masonry on this project — the 14 stone piers and the masonry abutments. The mild steel support beam and channel were built by the Daydé and Pillé firm of Creil. His famous Tour Eiffel is built from wrought iron, an alloy with very low carbon content (less than 0.08% typically) with fibrous slag inclusions. But the increasing quality and decreasing price of mild steel during this period made it the favored material for bridges and other structures. Mild steel has more carbon, 0.12—2.0%, for a much better trade-off of strength and workability. The span is 662.7 meters long and 11.5 meters wide including the two towpaths, now footpaths, lined with decorative lamp posts. The channel conforms to the Freycinet gauge, 6 meters wide and 2.2 meters deep. The Spanish Civil War was coming to its violent end in late January of 1939. Generalísimo Francisco Franco's advancing troops were driving refugees out of the collapsing Spanish Republic. More than 2,800 Spanish refugees arrived in Orléans between January 29 and February 8 of 1939. There was only limited space in Orléans to house the refugees, so 46 rural shelters were established including ones in Briare and Châtillon-sur-Loire. The refugees were mostly women and children, as the men were disarmed and detained in southern France. Some of the refugees returned to Spain before the Second World War started on the first day of September, 1939. Those who stayed found work in nearby glass and ceramic factories. The German invasion of Poland on September 1, 1939, began World War II. By June, 1940, invading German forces were penetrating into this area of France. Spain under Generalísimo Franco would have been better than France under the Nazis. French and Belgian forces were surrounded by the advancing Germans at Dunkirk, at the northernmost tip of France, on the coast along the border with Belgium. 340,000 British and French soldiers were evacuated to Britain by sea between May 31 and June 3. The most experienced one-third of France's soldiers were now out of operation, with almost all of their equipment and supplies lost. The German Wehrmacht accelerated its advance into France, crossing the Seine at Elbeuf in Normandy between Paris and the coast. They encircled Reims and were approaching Paris. The French government evacuated to Tours and the castles and châteaux surrounding that city on the evening of June 10. The castles and châteaux had been built in earlier centuries and many were connected to the world by just one crank-powered phone. General Maxime Weygand, the head of the French Army, had moved his General Headquarters the day before to Le Château du Muguet. This château is six kilometers northeast of Briare, near Breteau on the Canal de Briare. 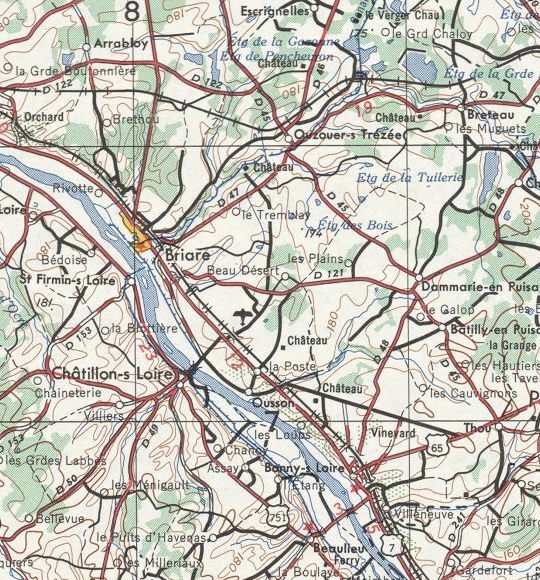 You can see the chaâteau on this map, north of the D 47 about two-thirds of the way to Ouzouer-sur-Trézée. It was built in 1863 in a neo-Louis XIII style. Charles de Gaulle had just been promoted to brigadier general, and on June 6 had been appointed as Under Secretary of State for War and National Defense. Early on June 9 de Gaulle had flown to Paris to meet with Winston Churchill, returning to Paris and continuing to Orléans later in the day to attend his first war council meeting. The conclusion there was that General Weygand was leading France into defeat. The Anglo-French Supreme War Council had been established around the outbreak of the war to oversee joint military strategy between France and the U.K. Most of its activity had been during the "Phoney War", after Germany invaded Poland but before the German Blitzkrieg westward began in May 1940. Now it met for three last times, first in Paris on May 31 and now for the Briare Conference on June 11 and 12, then one last time the following day in Tours. Winston Churchill and Anthony Eden, his Secretary of State for War, landed on a small airfield near Briare on June 11. They were joined by General Sir Edward Spears, the British special envoy to the French Government; Hastings Ismay, who would become Churchill's military advisor; and Sir John Dill, Chief of the Imperial General Staff. The French representatives were Paul Reynaud, the Président du Conseil or Prime Minister; Marshal Philippe Pétain, a military hero of WWI; General Charles de Gaulle; General Maxime Weygand and his deputy General Alphonse Georges; Colonel Villelume, Chief of the Ministry of War; and the diplomat Roland de Margerie. There were tensions between the British and the French and also between the French political and military leadership over how, and whether, to continue the fight. Spears recorded that he suddenly realized during the meeting the first evening that "The battle of France was over and no one believed in miracles." Weygand's description of the military situation the next day as "a catastrophe" reinforced this impression. Meanwhile, both Churchill and Spears were impressed by de Gaulle. Churchill remarked later that de Gaulle was the only French representative who hadn't sunk into complete pessimism. The council met again on the 13th in Tours, and the British leaders returned to London. The French government withdrew further to Bordeaux, where Reynaud resigned three days later. Pétain was appointed the new chairman and almost immediately began negotiating an armistice with Germany. Paris was named an "open city" on the 14th, and an armistice was signed on the 22nd. Germany would occupy the north and west, Italy would have a small occupation zone in the southeast, and the rest would be controlled by the Vichy government, a puppet of Nazi Germany. Pétain was Chief of State of the Vichy government 1940–1944, for which he was convicted of treason after the war. He was imprisoned on the Île d'Yeu off the Atlantic coast until his death in 1951. General Georges refused to have any role in the Vichy government. The Allies landed in Normandy on June 6 1944. Allied forces immediately started moving east. German units cut off in Brittany or southern France could be kept bottled up there while maximum effort was invested in moving inland and starting east. 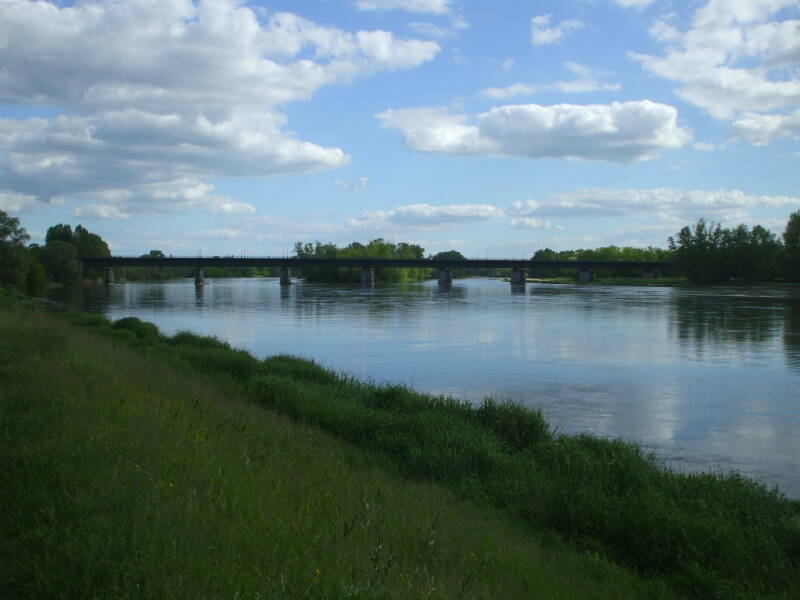 In August the 2nd Parachute Regiment of the Free French forces began operations along this stretch of the Loire to isolated remaining German forces on the west bank of the Loire. This was part of Operation SPENCER, an allied offensive under British command intended to hinder the withdrawal of German troops from southwestern France toward the northeast. The Free French paratroopers were affiliated with the British Special Air Service. Operation SPENCER began on August 5 with the transfer of ten Waco gliders to the French SAS. Each glider could carry three SAS troops and one armed jeep providing mobility and firepower. The jeep was equipped with a Vickers machine gun capable of firing 450–600 .303 rounds per minute. They landed on August 21. 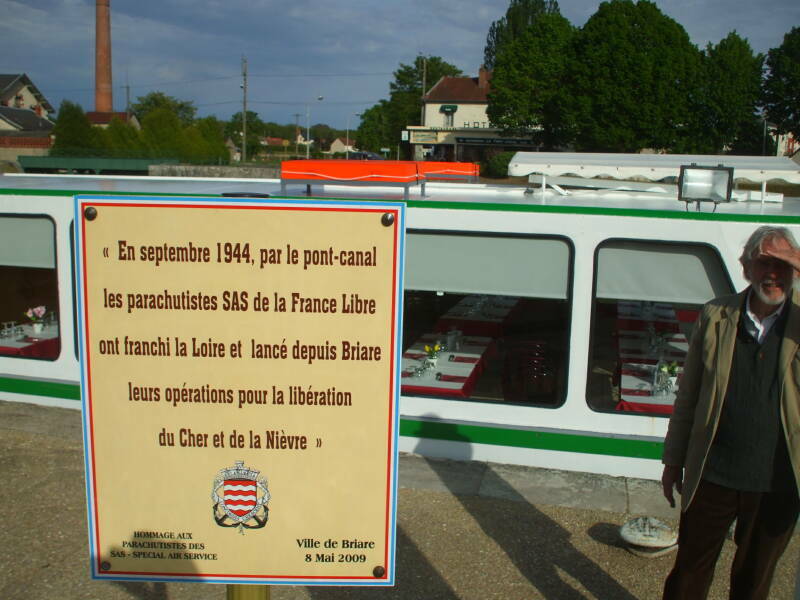 On August 29, the first group of French SAS left Vannes in the direction of Briare. They had been poorly informed about the achievements of the Resistance, so they advanced much faster than expected and arrived at Briare on the 30th and seized the town on the 31st. Meanwhile, Paris had been liberated on the 25th. Saint Stephen's Church is on the central square. 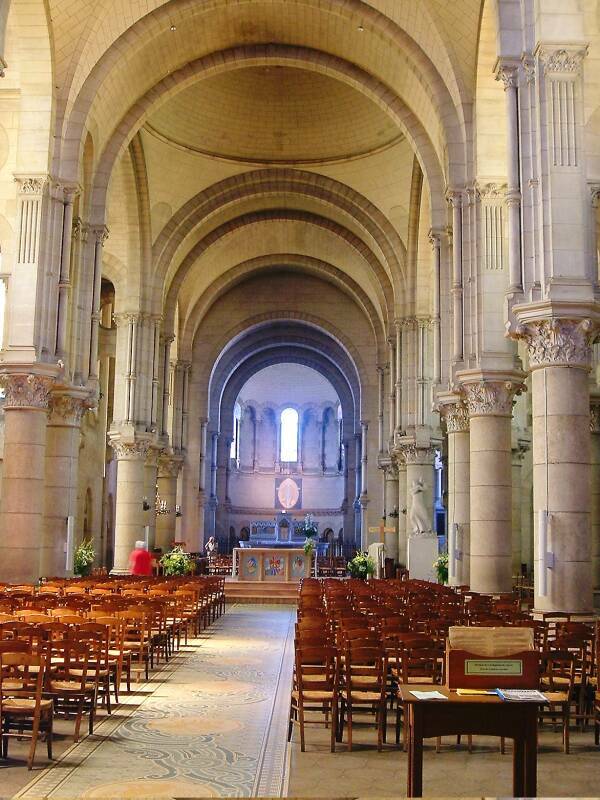 It was built in 1890–1895 in a Romano-Byzantine style. Its construction was funded by an industrialist who owned the Briare enamel factory, and it is decorated with his company's enamel tiles. 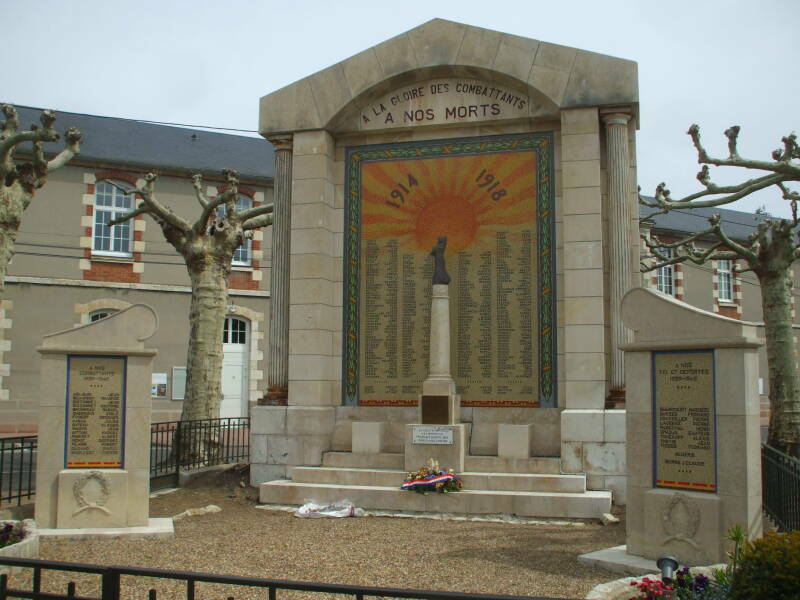 They lost 16 to combat in 1939-1945, listed on the smaller marker at left, plus 10 who either died in the French resistance or were deported to death camps, listed on the smaller marker at right. This house along the main road is decorated with mosaics that also advertise that the occupant is a mosaic artisan. Emaux de Briare specializes in mosaics. 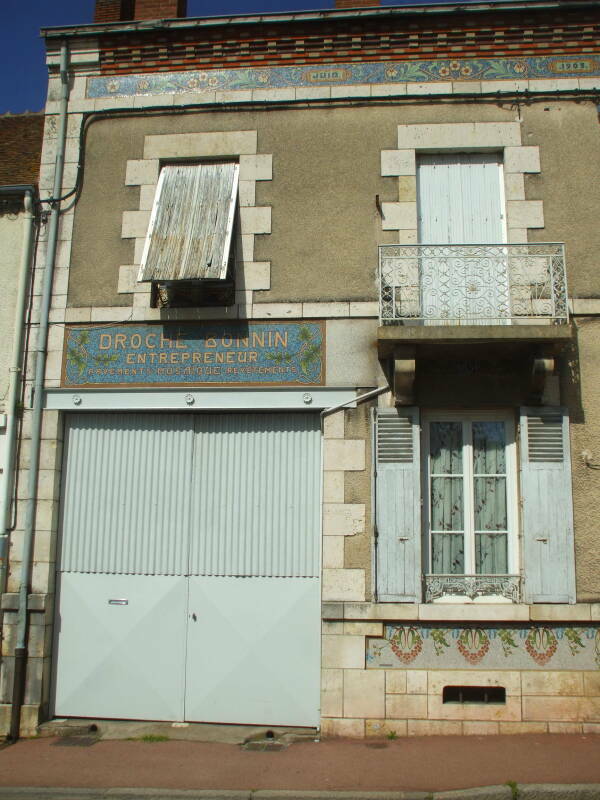 Its manufacturing plant in Briare started with earthenware pottery in the early 1800s. It merged in 1851 with the Bapterosses and Cie factory in Paris that had been manufacturing porcelain buttons since 1845. They had come up with the innovation of adding casein-rich milk to the slip to increase plasticity. This allowed them to mold 500 buttons at a time versus the single button of the competing English process. 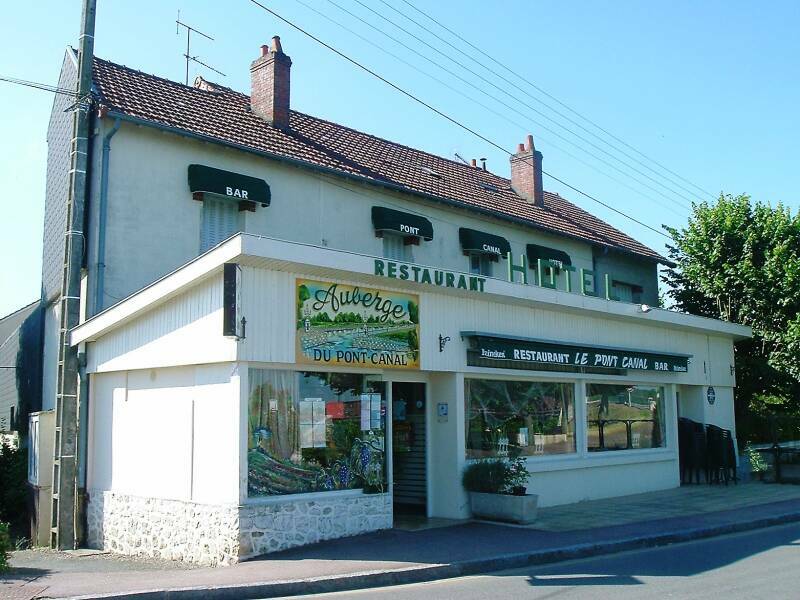 The location in Briare was just 150 km from Paris on a national road, and on the Loire river and two shipping canals. Raw material of clay and coal plus Norwegian feldspar and other pigments were easily shipped in, and finished product shipped out. Plus, a nearby farm provided the milk. By 1898 the factory employed 550 people to produce 1.4 million buttons and artificial pearls per day. It consumed about 10,000 tonnes of coal and 500 cubic meters of wood per year; 2000 tonnes of feldspar and 500 tonnes of metal oxides and other pigments. The Art Nouveau movement drove a renewed interest in mosaics. Emaux de Briare had been manufacturing mosaic enamels since 1882, and soon introduced a system of pre-cut mosaic components that made it easier and cheaper to decorate buildings. They then transitioned their mosaic design and marketing to the Art Deco movement, then the Op Art movement. 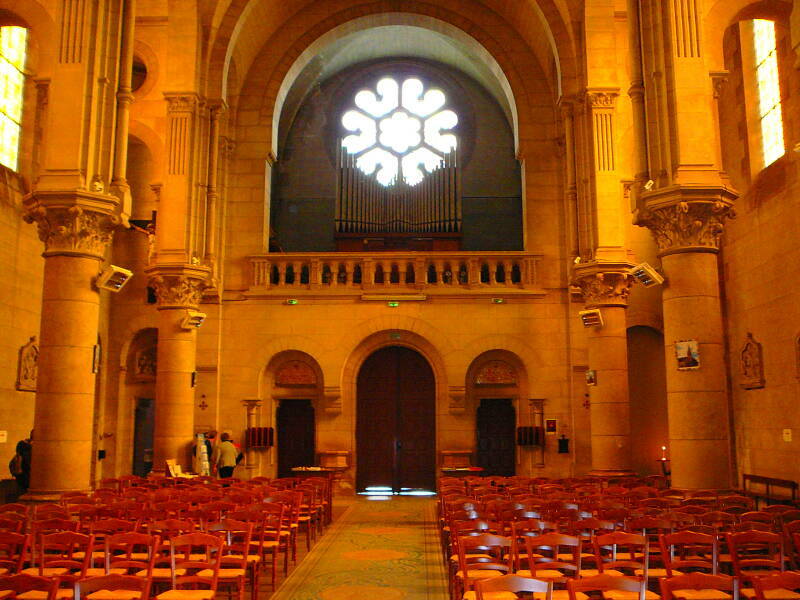 The company's mosaics are used in the local Saint Stephen's Church as well as the Basilica Sâcre-Coeur in the Montmartre district in Paris, the Basilica Nôtre-Dame-de-la-Garde in Marseille, and many other prominent churches, mosques, palaces, airports, and other public buildings. Emaux de Briare today sells mosaics world wide. Its sales headquarters is in the 10th arrondissement of Paris, with shops there and the 7th arrondissement. Its U.S. headquarters in Bayshore NY sold a mosaic walkway titled Chromatic Induction in a Double Frequency, designed by Venezuelan artist Carlos Cruz-Diez, to the new Miami Marlins baseball stadium. 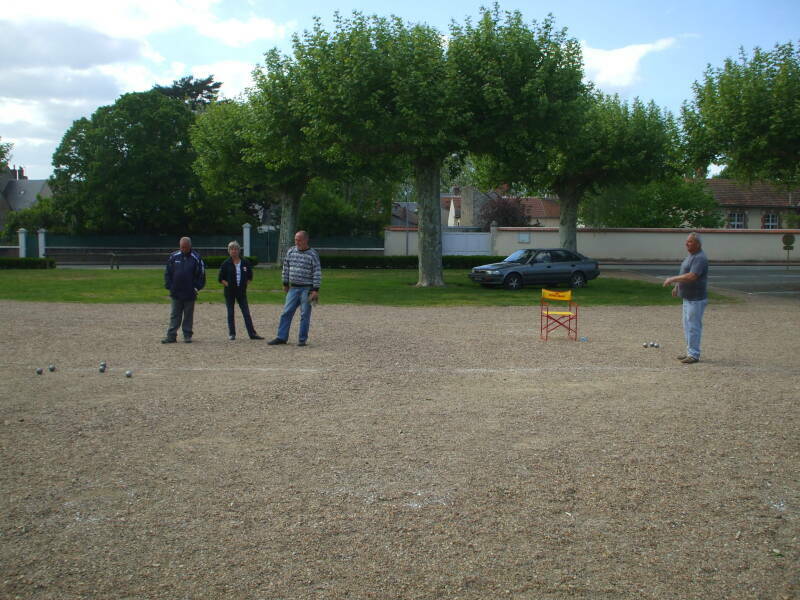 Of course pétanque is played. 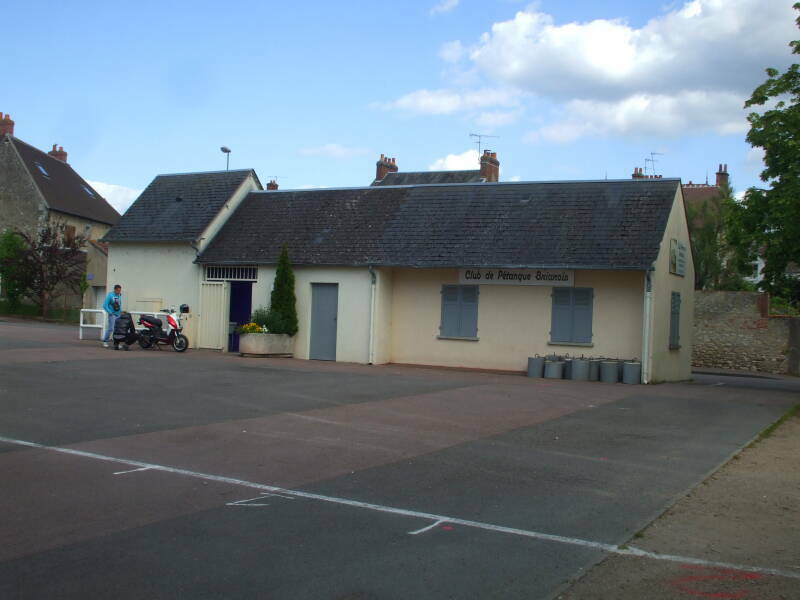 The Briare pétanque club even has a club house in the main park. We stayed at the Auberge du Pont Canal. 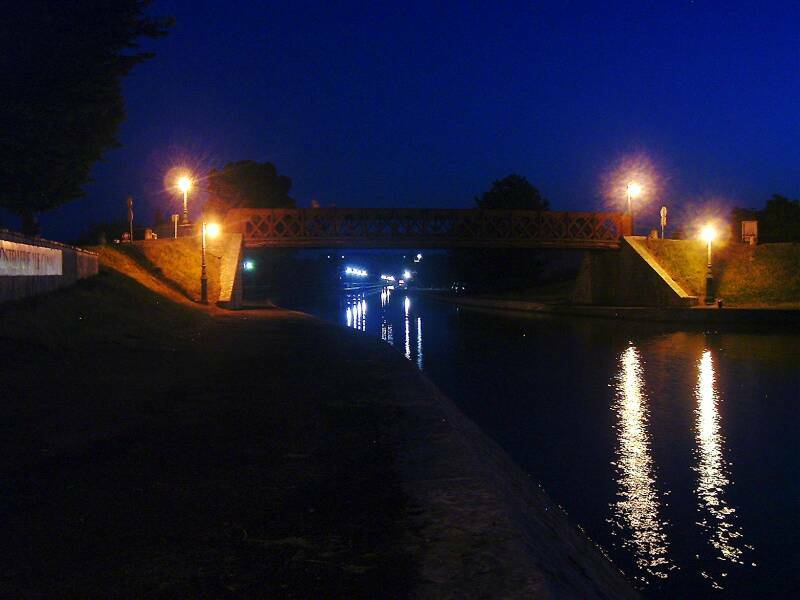 It's right along the canal, a short walk from the end of the Canal Bridge. They have several rooms upstairs and in a rear wing, and a restaurant in the front. 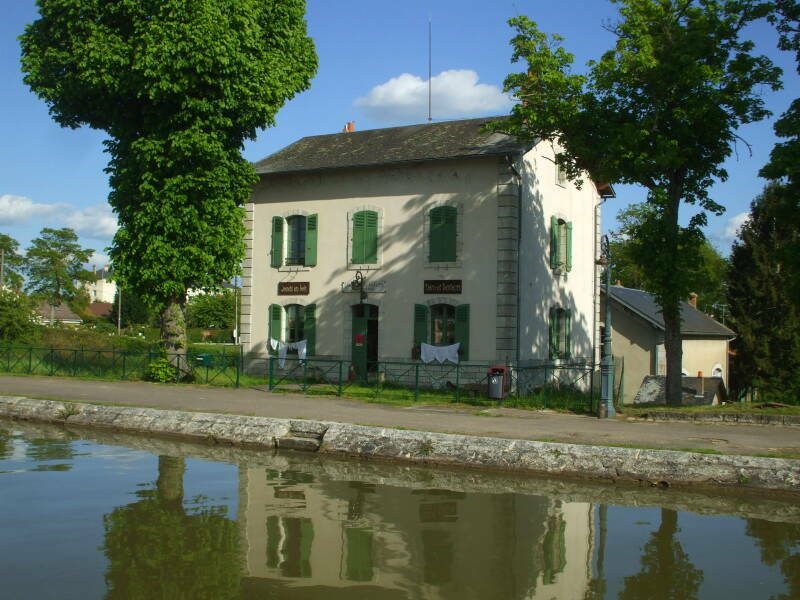 The canal has a wide basin in front of the auberge. In 2005 the boat rental company's operation was just across the canal. 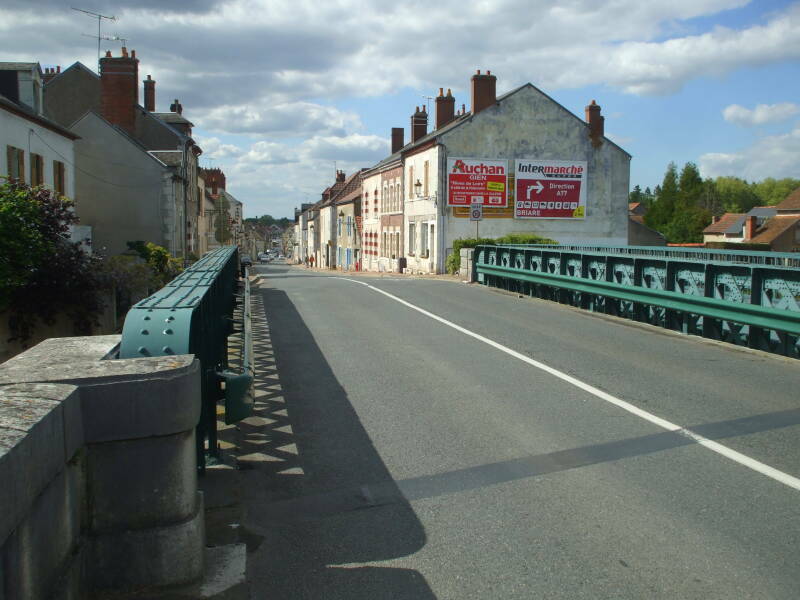 In 2012 the Briare end of the trip was actually based just south of Châtillon-sur-Loire, five to six kilometers beyond the far end of the Canal Bridge. The auberge owners can set up a taxi to get you there. 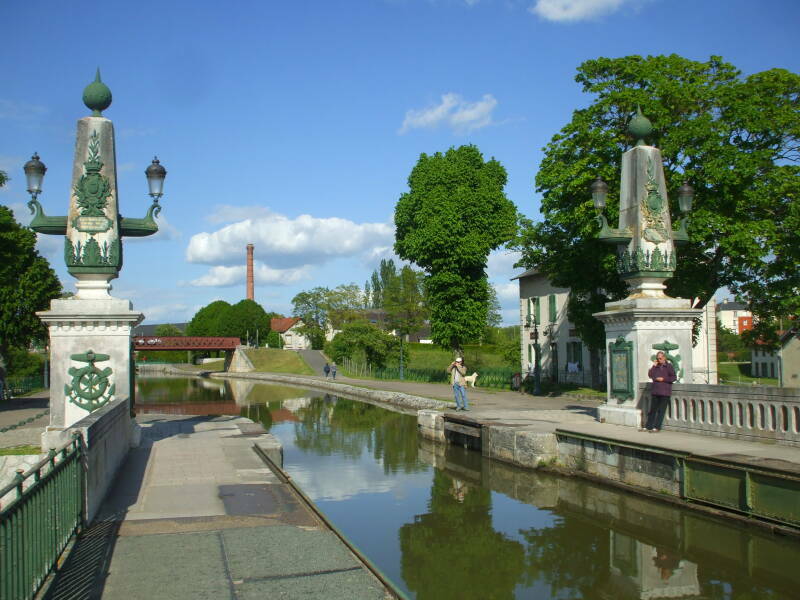 The decorative columns at each end of the canal bridge are like those of the Pont Alexandre III, the most ornate bridge in Paris. You might run into a man herding his sheep and goats on the opposite side of the Loire. We spent two nights in Briare, as most of the group had just arrived in France. I met them at Charles de Gaulle airport outside Paris in the morning and we came down to Briare later that same day. Two nights in Briare gave them a full day to explore a pleasant town while getting over jet lag and acclimatizing to being in France. About noon the next day we will load up our rented canal boat and start our trip south toward Decize!